Sleep. Just uttering the word can induce a yawn and have you eagerly anticipating those blissful hours when you get to lie down and drift off into a dream. Everybody loves sleep. Plus, those hours when your consciousness is temporarily suspended and your brain rests is also vital for your health. So it’s no wonder why we’re so dang particular about how we sleep. Truth be told, everybody has a certain preference when it comes to how you sleep, and that’s exactly why we’ve created different sizes and shapes for our mattresses. 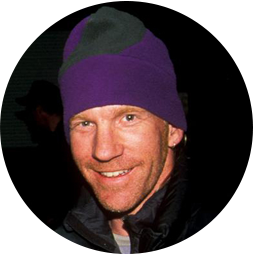 After all, we understand that sleep is the unsung hero of great days in the outdoors. 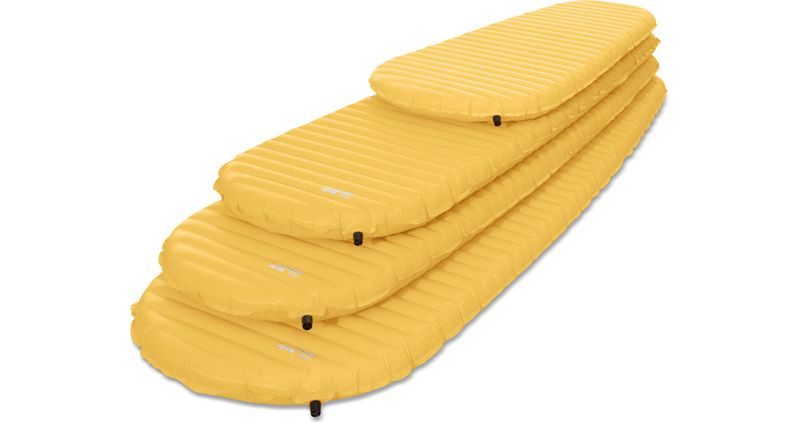 So when you choose your next camping mattress, there are a few crucial considerations to make. There was a time when we made all our mattresses the same rectangular shape. However, in 2003, we took a cue from sleeping bags and introduced the mummy-style cut (which tapers toward the feet) in our mattresses. Honestly, the initial reason for this new shape was simply because it looked cool. But by 2009, we realized we could also shave off a few ounces with our mummy-style pads. These days, if you’re a Fast & Light ounce counter, a mummy style mattress is probably your weapon of choice. Beyond the obvious fact that they weigh less, these pads also pack down smaller, saving valuable room in your camping kit. However, though less equals more space in your pack, it also means less sleeping area at the end of the day. For those that hate feeling restricted during slumber, a traditional, rectangular pad may be the optimal choice. You may gain roughly five ounces or more of weight going traditional, but you’ll also have more room to spread out at night. Another factor to consider when choosing the shape of your pad is the weather you’ll be camping in. Diehard, dead of winter campers often prefer a traditional shaped pad. Why? Because these pads are wider, which means you have more room to move and spread out before reaching the edge of the pad where the insulation ends and the cold begins. Check out the NeoAir XTherm Max for a prime example. There are two elements to contemplate when sizing up your pad: length and width. When choosing your pad’s length, it’s not always about how tall (or short) you are. Sure, that’s the basic rule of thumb. If you’re tall, consider a size large, which in our case means a pad that measures about 6 feet 5 inches in length. Our size Regular, for reference, is 6 feet. Both of these are considered “full length” mattresses. However, some campers actually prefer a size small, which measures about 3 feet. Why? Because they would rather save weight and room in their pack and rest their body length (usually lower legs and feet) on their backpack. Once again, the length of your mattress is all about preference … and of course your height. Then there’s the width. Most of our mattresses are 20 inches wide in size Regular, and 25 inches wide in size Large. But here’s the cool part. Recently we also introduced the size Regular-Wide. Yep, this is a 6-foot long mattress that’s 25 inches wide for those who dig more sleep surface. So once again, we’ve done our best to give you a host of choices so you can fine-tune your sleep system. We created our women’s mattress with two things in mind: length and warmth. Because women are, on average, shorter than men, our women’s specific pads come in shorter lengths. That way, if you’re a 5’4” female, you don’t have to buy a 6-foot pad. You can purchase the 5’6” pad instead and save unwanted weight and bulk. But these pads aren’t just shorter, they’re warmer too. Because body mass is basically the main deciding factor to how warm you sleep, smaller people (men or women alike) can use a little added warmth. So our women’s specific mattresses have a few special tweaks to make them warmer. In foam versions we make fewer die-cuts in areas where more warmth is needed—the hips, foot and torso areas of the mattress. Anatomically, the added hip foam also happens to provide extra support for side sleepers. In the women’s specific NeoAir Xlite, an extra layer of ThermaCapture—our reflective barrier technology that traps radiant body heat—provides the extra warmth. If you’re next question is: But what if I’m a dude, can I still rock a women’s mattress? The answer is yes. If you’re looking for extra warmth in a shorter length mattress, by all mean’s eschew the “women’s specific” label. 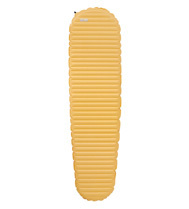 Rocking a women’s NeoAir Xlite, for example, is an efficient way to carry less, yet sleep with a robust R-Value of 3.9. So now that you’re well versed in the sizes and shapes of camping mattresses, you’ll be able to navigate the plethora of choices with ease and find the perfect fitting pad for your camping adventures. 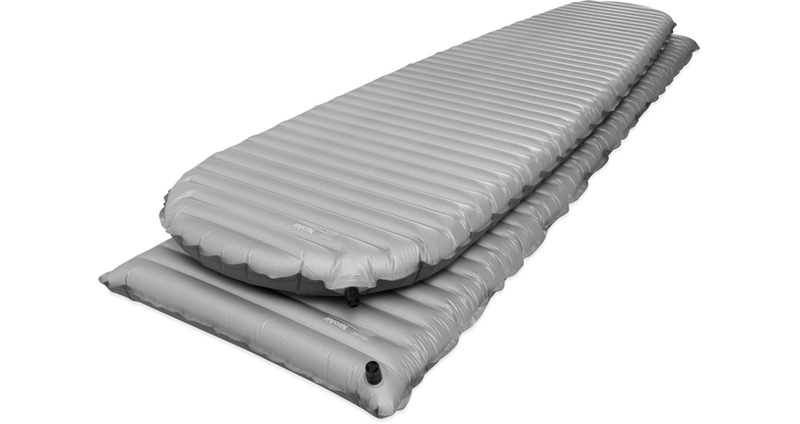 And if you think you’ve got the size and shape dialed, but are still questioning other variables (such as air vs. foam) when it comes to choosing the perfect camping mattress, don’t despair. Check out our infographic we created specifically to help you make those crucial decisions and find the camping mattress of your dreams!